Milwaukee Brewers vs. Pittsburgh Pirates Tickets - 6/29/2019 - Miller Park in Milwaukee at Stub.com! All of our tickets are sent out via FedEx unless shipping is not an option due to time constraints. Standard FedEx shipping is two day delivery and if needed we have Express Next Day and Saturday Delivery. If shipping is not an option due to time constraints, then you tickets will be delivered via email, will-call or local office pickup with a ticket specialist in your area. We guarantee all ticket orders will be received on time for the event! To protect the privacy of both buyers and sellers, we do not disclose specific seat numbers. Once the order is processed you will be receiving a confirmation email which will have your seat numbers listed. If you would like even more information, we provide you with your ticket broker's information on the receipt; feel free to contact them and they would be happy to assist you with any questions. 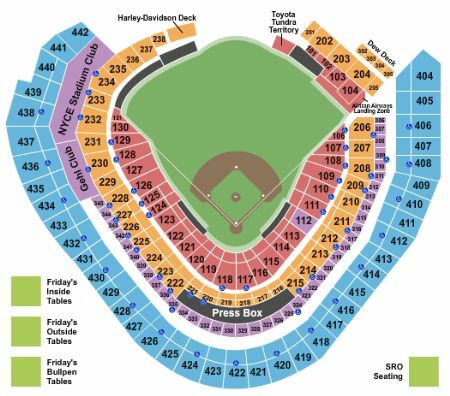 Can I find my seat numbers? All ticket groups have consecutive seating (seats next to each other) unless otherwise clearly stated on the ticket notes. It is very rare for any tickets groups to have split seating. If there is a note icon on the ticket listing, just roll your mouse over the icon to see more details. Are the seats next to each other? The ticket prices are determined by the listing ticket broker. These prices are determined by the ticket market value for that show or event. The prices may vary per ticket broker for similar tickets because of each broker's perception of the market and the cost incurred to obtain the tickets. Your personal billing information is strictly protected by Stub.com with today's top security companies, 128 bit security encryption, HackerSafe, McAfee, as well as GoDaddy SSL certificates. We only use the most cutting edge technology available to provide you the confidence and security you deserve. Free updates, discounts and hot events in your area, sent right to your email! Stub.com is committed to provide you the best buying experience and a 100% Buyer Guarantee. Shop with confidence at Stub.com! We'll send you an email if the price drops Below your specified price. These seats have chair backs. Tickets will be ready for delivery by Jun 27, 2019. Tickets will be ready for delivery by Jun 25, 2019. Parking Pass Only. Does not include admission to event. Preferred Parking. Does not include admission to event. Does not include admission to event. Tickets will be ready for delivery by Jun 22, 2019. Tickets will be ready for delivery by Jun 24, 2019. Does not include admission to event. Tickets will be ready for delivery by Jun 25, 2019. Third row in this section. Second row in this section. First row in this section. These are Club Section seats. These seats have chair backs. First row in this section. These seats have chair backs. First row in this section. These are Club Section seats. These seats have chair backs. Tickets will be ready for delivery by Jun 19, 2019. First row in this section. These are Club Section seats. These seats have chair backs. Waiter service included. Second row in this section. These seats have chair backs. Aisle Seats. Fourth row in this section. These seats have chair backs. These seats are directly behind the visiting team dugout within the first ten rows. These seats have chair backs. Aisle Seats. First row in this section. These are Club Section seats. These seats have chair backs. Waiter service included. Second row in this section. Second row. These seats have chair backs. These seats are directly behind the home team on deck circle within the first 10 rows. These seats have chair backs. Sixth row in this section. These seats are directly behind the home team dugout within the first ten rows. Seventh row in this section. These seats are directly behind the home team dugout within the first ten rows. Sixth row in this section. Seventh row in this section. These seats are directly behind the visiting team dugout within the first ten rows. These seats are directly behind the visiting team dugout within the first ten rows. These seats have chair backs. Third row in this section. Third row. Tickets will be ready for delivery by Jun 26, 2019. These seats are directly behind the home team dugout within the first ten rows. These seats have chair backs. Third row in this section. Third row. Second row in this section. Second row. These seats are directly behind the home team dugout within the first ten rows. These seats have chair backs. These seats are directly behind the visitors on deck circle within the first 10 rows. These seats have chair backs. Third row in this section. Third row. Second row in this section. Second row. These seats are directly behind the visiting team dugout within the first ten rows. These seats have chair backs. Standard Hotel Package includes 2 nights at a 4-Star property near the venue (check-in day before game, check-out day after game) | Field Infield Box game ticket in sections 110 thru 125 (orders of three or more may be split) | $25 food/beverage credit included with each ticket | MLB merchandise of your choosing valued at $50 per person redeemable online only | Ticket upgrades - additional hotel nights or specific days may be obtainable upon request | Rate is based on double occupancy | Orders for a quantity of one are subject to an additional charge |. Deluxe Hotel Package includes 2 nights at a 4-Star property near the venue (check-in day before game, check-out day after game) | Roundtrip airport transfers | Field Infield Box game ticket in sections 116 thru 119 (orders of three or more may be split) | $25 food/beverage credit included with each ticket | MLB merchandise of your choosing valued at $50 per person redeemable online only | Ticket upgrades - additional hotel nights or specific days may be obtainable upon request | Rate is based on double occupancy | Orders for a quantity of one are subject to an additional charge |.